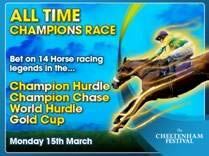 For those punters who simply can’t wait for the Cheltenham Festival to start, William Hill is starting a day before anyone else by staging four ‘All-Time Champions Races’ tomorrow afternoon (Monday 15th March 2010). Who is the greatest? It’s a debate that has divided punters for decades, and whilst the countdown to this year’s War of the Wolds battle between Kauto Star and Denman continues, William Hill is set to pit these contemporary gladiators against the legends of eras past like Arkle, Mill House and Bregawn. Hills are running four simulated races on Monday 15th March, to whet the appetite of punters ahead of the finest four-days of jump racing known to man. Of course, the debate doesn’t end with the Gold Cup. The ‘All Time Champions Series’ for the Champion Hurdle, World Hurdle, and Champion Chase will all be staged in an effort to find out if Istabraq is greater than Sea Pigeon? Is Master Minded mightier than Moscow Flyer? Or can Big Buck’s better Baracouda? The tapes go up metaphorically speaking at 1pm on Monday in all 2400 William Hill betting shops, kick-starting Cheltenham a day early when the greatest names in jump racing history finally line up together. There is a slight twist, for system reasons and in order not to confuse bets on these races with those later in the week, punters wanting to back Kauto Star against Arkle or Mill House, will be writing Kauto Tsar on their slip or Minded Master (instead of Master Minded) against Viking Flagship. Punters can bet on all four races exclusively in William Hill, and a percentage of any profits on the races is being donated to the four Cheltenham charities connected with the Cheltenham Charity Song – Racing Welfare, Bob Champion Cancer Trust, National Rehabilitation Hospital (Ireland) and the Riding for the Disabled. The All Time Champions Races are being run under the normal guidelines of all Hills RNG events.